At this point, I think we can assume that the story-driven approach is here to stay. 2K may change things up as they did with Orange Juice and the dual player controls in NBA 2K17 or the Takeover mechanic in NBA 2K19, but whatever new wrinkles we see, MyCAREER is likely going to involve playing through some kind of a story. As I’ve said before, I think MyCAREER stories would really benefit from meaningful choices and story branching, but I do like what NBA 2K19 did as far as ending the story at the start of our NBA career, and subsequently providing the option to skip The Prelude upon beginning new MyCAREER games. It was an overdue addition. 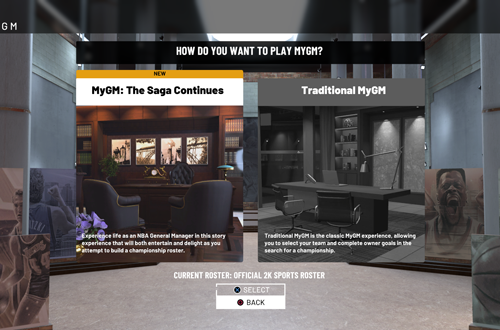 It’d be even better if we could choose to skip straight to the beginning of our NBA career without ever playing through the story, similar to how MyGM now offers both a story and the traditional approach (on top of the separate MyLEAGUE mode). I’m sure a lot of gamers who are fans of MyCAREER mode and its connected experiences would like the option of skipping the story entirely and focusing on the NBA, 2K Pro-Am, or The Playground. Of course, a lot of work goes into the stories, so I’d suggest providing gamers incentives to play through them, such as additional chances to earn VC, better starting ratings and salaries, and so on. The trade-off would be our choice. 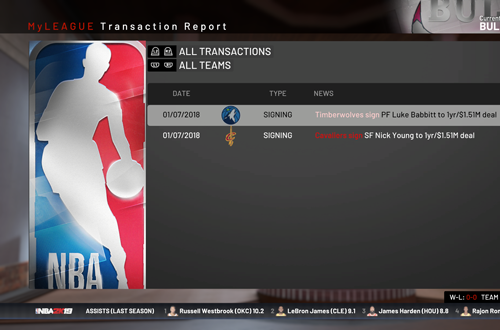 The most painful part of MyCAREER is starting over again every year. On top of any attachment you have to your career in the previous game, each new release puts you back at square one: a low-rated player with a lot of grinding ahead of them. There are naturally shortcuts to levelling up your player and making them viable for online play, such as pre-ordering the special edition with all its extra VC, or just purchasing VC. 2K obviously won’t be too inclined to interfere with those revenue streams, but they would show a lot of goodwill if they offered a returning gamer bonus. It needn’t cut into their revenue, and might even encourage some more pre-orders. Basically, I’m talking about providing gamers with a head start based on the progress that they made in the previous game. So, for example, my NBA 2K19 MyPLAYER who is currently rated 92 Overall would be able to be used for a one-time boost for a new player in NBA 2K20. It shouldn’t immediately rocket me up to 92 Overall, but even if it got me to around 75 Overall and unlocked a few Badges, it would be a nice gesture that recognises the grind from the previous year, and rewards brand loyalty. The boost should scale with the player you’re “importing”, and there should still be a long road ahead, but it would really ease the pain of starting over from scratch. Given the depth of MyCAREER, some of the features that are missing are rather surprising. One example that springs immediately to mind is the transactions listing, which is completely absent. At least, I’m fairly sure it is; I’ve been through all the stats screens in MyCAREER, and I can’t seem to find it anywhere. While MyCAREER is a mode that revolves around your avatar, it is important to be able to see what’s going on with the rest of the league. The league and team records are easily accessible along with award histories and current season stats and standings, but transactions are not. They do show up in the social media feed, but it’s not really convenient or sufficient. 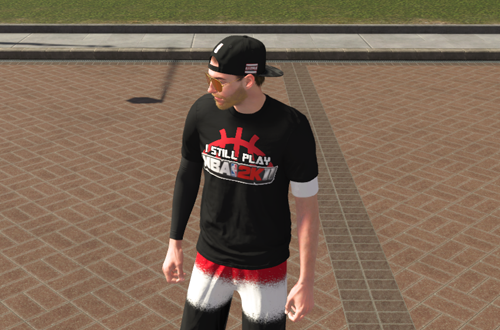 While running experiments in NBA 2K19’s MyCAREER, I discovered that retiring from the NBA doesn’t lock the save and prevent you from using that player in the online modes. That’s good news, but after you retire, you can’t view any league stats or records, or even your player card with your year-by-year career stats. If you want to look back through all of your accomplishments, it can’t be done unless you grabbed some screenshots while you had a chance. This may not be a big issue for a lot of gamers, but it’s a shame to have to choose between seeing the Hall of Fame cutscene and accessing a record of your career achievements. It’s an easy fix for NBA 2K20. Another discovery I made while messing around with MyCAREER experiments was that offline, the mode looks and functions a lot like MyLEAGUE. As I noted, it’s a viable alternative if you’re not interested in the connected modes and want to play a straightforward single player career, but it’s extremely limited. It’s also not something you can just choose; you need to go offline and then start the game to get that option. 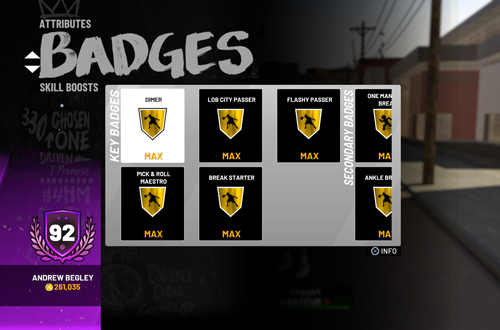 I’ve come to tolerate The Neighborhood – especially with the redesign in NBA 2K19 – and I do have an interest in 2K Pro-Am and The Playground, but it would be great to have an alternative without settling for the offline version of MyCAREER. My suggestion would be to copy NBA 2K17’s interface and approach, where you load into your MyCOURT and can access everything from the menus while you’re in there, from purchasing items (essentially shopping online) to loading directly into your team Pro-Am arena or the Jordan Rec Center. Going to The Playground or playing any of the Neighborhood games would still involve getting in the elevator and going down to the street, where you could also visit stores in person if you like the visuals, or don’t want to duck back to your MyCOURT to shop or load into Pro-Am. This way, The Neighborhood is still a hub, but can also be avoided if you’re not into The Playground. 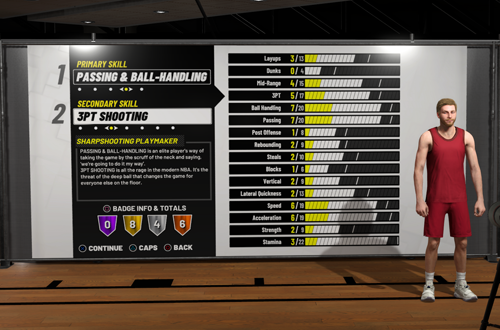 MyPLAYER Archetypes have been a mixed bag, especially with the hybrid types that were introduced in NBA 2K18. In theory, they’re meant to balance the game through giving each Archetype a trade-off of strengths and weaknesses, but the Archetypes themselves aren’t balanced. This had led to a lot of meta-gaming with most players picking from a small selection of the most powerful Archetypes, and Archetypes that are too restricted to be fun and viable online and offline. In other words, the measures intended to increase the number of options for player types has in fact narrowed the number of desirable ones, and done little to balance online play or reduce cheese. NBA 2K19’s new Takeover mechanic didn’t help matters, so if the developers are looking to nerf anything for NBA 2K20, that would be a good place to start. It’s also important that most (if not all) Archetypes and hybrid Archetypes are viable choices for both online and offline play. One solution would be to allow Archetypes to evolve based on the user’s performance; shooters could become stronger defenders, players could develop an outside shot, and so on. The restrictions certainly haven’t had their desired effect, so more flexibility might be in order. As it stands, the current approach to Archetypes is actually getting in the way of the balance it was meant to achieve. What do you feel would enhance MyCAREER in NBA 2K20? Have your say in the comments section below, and as always, feel free to take the discussion to the NLSC Forum! That’s all for this week, so thanks for checking in, have a great weekend, and please join me again next Friday for another Five.